Free Tickets: Discotheque this Friday at Assembly! It’s time to Disco this Friday at Assembly! 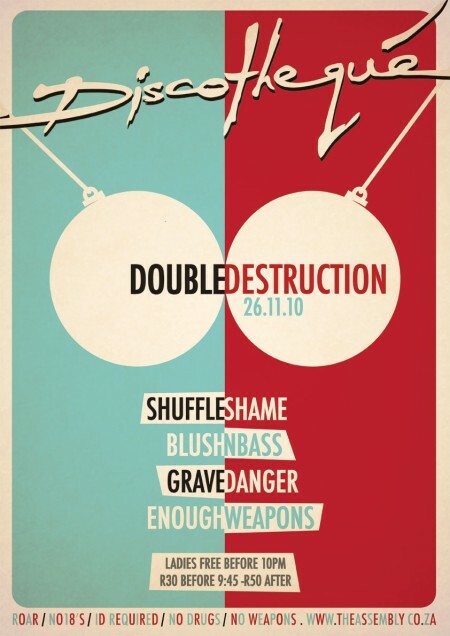 Discotheque presents Double Destruction, featuring Shuffle Shame, Blush n Bass, Grave Danger and Enough Weapons. Assembly and Electrotrash are offering 2x double tickets for the party. All you have to do is email us and answer this simple question: Who invented the lightbulb? First two correct answers will get the tickets. The party is this Friday in Cape Town, so please only enter if you can actually make it to the party! Competition closes Wednesday at 23h59… Good Luck!